Our second linky is all about surviving your fist week back at work. Checking off your to-do list! For me the beginning of the year is overwhelming because there is so much to get done! Where do you even start? AND my first day is TODAY! ACK!! What I have done to be less "frenzied" is pick on are to focus on related to my students, myself and one that is related to parents/teachers. This year with my students, my focus will be on lesson planning ahead of time. Last year it was data collection. I plan on filling out a weekly sheet that outlines what I will do and develop my theme units more this way! I also pick an area of speech and language to focus on with CEUs to become more of an "expert" in that area In past years I have focused on voice disorders, fluency, selective mutism, ASD and articulation. Usually it depends on what type of students are on my caseload each year. I tend to pick on that I feel like I need some brushing up on! With parents and teachers, I want to focus on communicating more. It can be hard to pull yourself out of the so called "speech cave". We get caught up with therapy and paperwork and forget to reach out and communicate. If we communicate more teachers and parents will have a better understanding of what we do and we will not longer be the, "mystery speech teacher". Hoping to set a goal of biweekly communication with teachers. 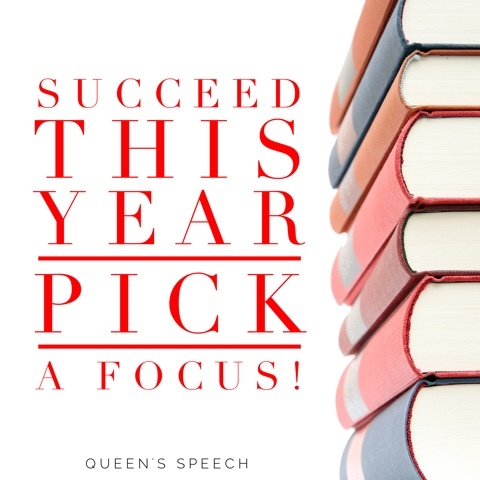 Hope this helped you select a focus for your year, Happy Back to School! Biweekly communication with teachers and parents sounds like a great plan-I look forward to hearing how you are making it work! I agree with your #3...we get so busy that we forget to communicate with parents & teachers! Being involved with the evening events at school helps! Love your tips and the order! Have a great year!